One of the most legendary directors of our time takes you on an extraordinary adventure. Much more of a sentence than a tagline! The official theatrical poster for Martin Scorsese's Hugo adaptation in 3D has been revealed on Moviefone and it's definitely something you need to see. 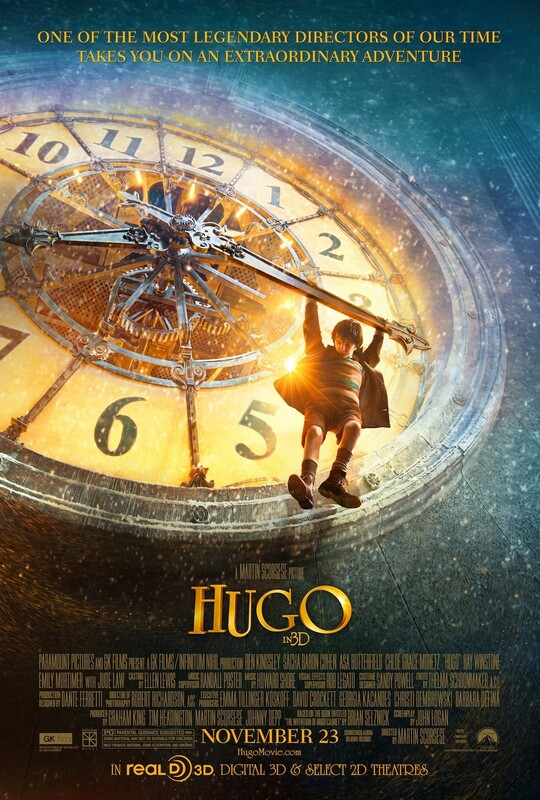 The classic design features Asa Butterfield as Hugo Cabret hanging from a clock hand, like we've seen in the trailer. The vintage design is inspired by the classic silent era and films like Harold Lloyd's Safety Last. It's a unique and eye-catching design and I'm glad they chose to go with something like this over the typical designs. Check it out below! Click below for high res via Moviefone. The first full trailer for Hugo, showing in 3D, can still be seen here. Set in 1930s Paris, an orphan (Asa Butterfield) who lives in the walls of a train station becomes wrapped up in a mystery with his young new friend (Chloe Moretz) that involves his late father and an automaton. Hugo, originally The Invention of Hugo Cabret, is directed by Oscar winning filmmaker Martin Scorsese, of films like Taxi Driver, Raging Bull, Goodfellas, Casino, The Aviator, Gangs of New York, The Departed and Shutter Island most recently. The screenplay was written by John Logan (Gladiator, The Time Machine, The Aviator, Sweeney Todd, Rango, Coriolanus, Bond 23), based on Brian Selznick's book. This was shot in 3D. Paramount is bringing Hugo to theaters everywhere starting November 23rd this fall. Good poster? LOVED the book. Hope this is just as good! Looks like something out of a Hitchcock film. I must be missing something here... I mean, I LOVE Scorsese but this movie looks...sappy. And this poster just screams to me The Polar Express or The Golden Compass. Also, it follows the tried and true cliche of movie posters of being blue and orange. This may possibly be my most anticipated movie to see in theaters this year. I'm not really excited about this movie other than the fact that its from Martin Scorsese, which is still weird considering this is (or looks like) a 3D kids film.